with 46% of the vote! Watercolor paints came in right behind colored pencils with only one vote less. Copic Markers and Zig Clean Color Real Brush Markers came in with one vote each. Thank you so much to everyone who took the time to vote. So, here's the deal. When I am feeling good and can sit at the table for a longer amount of time, I will give watercolors a try. I've watercolored with ink from ink pads before and a waterbrush, but these paints scare me. I think it's because they look so official and fancy. When I am not feeling so great and I need to sit with my feet up, I will use colored pencils. This should make the majority of you happy! For my Copic and Zig friends, I suspect you'll see those coming up in the near future as well. Using colored pencils is not a fast way to create a card! I need to make a card for a family who worked with me in Arizona that doesn't have long to live after a lengthy battle with cancer. I need to make a card for a friend who's husband passed away and I just now found out about it. I need to make a card for a dear friend. I need to make a card for a second dear friend. I need to make another card for a third dear friend. In other words, I need to have my body cooperate, get on the ball, tackle my ta-da list and get some cards in the mail. There is probably going to be a lot of straight stamping involved in those. I won't be able to show you either when I first make them because some of those people follow my blog. I started working on an image for all of you tonight! My tulips were first colored in with an R20 Copic Marker. 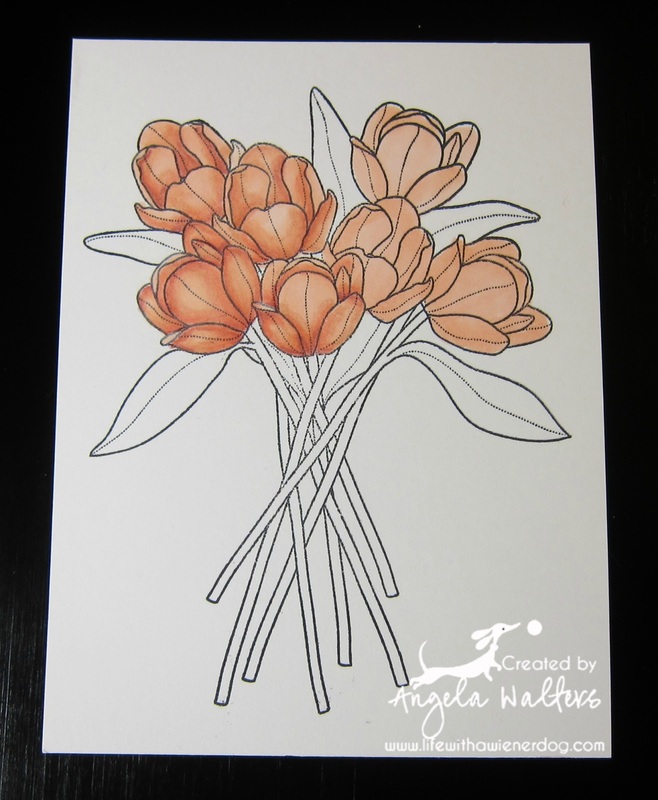 You can see this first step on the right side of my picture where three of the tulips are just this pinkish coral color. 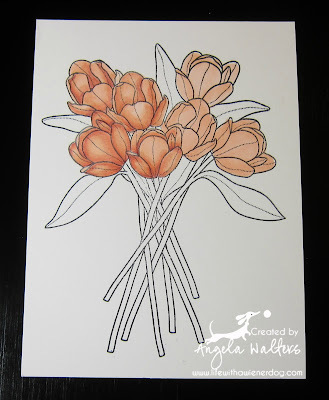 I used a white, a burgundy, and three different colors of pink pencils to do the shading on my tulips. I worked for about 2 hours and got 4 tulips done. Partially, this is because I'm slow, new and need a lot more practice. However, it's also because it takes a lot longer to lay down layers of colored pencil work than it does other mediums. My guess is we're talking another day for flowers and a third for the leaves and stems. I am thinking about stamping this same image again and coloring it completely with Copics so then we can compare the two. No matter what, I'll keep you posted on the progress. Wish me luck! Whatever you use is fine with us. The tulips are amazing with your shading! Oh so pretty! You could put the tulips (as is) on a black and white polka dot background and call it a card! I have seen lots of cards that don't color the whole image these days. Or even just a black mat like in your photo would be great and attach to a card. Amazing! I am so envious!